With the passage of time, supply chain processes have shifted toward IT-based business processes regarding service-oriented architecture (SOA) to augment the agility, integration, and flexibility of IT-based applications in enterprise networks. SOA, as a fast-growing paradigm in IT, uses Web service technologies and provides new pattern integration and interoperability in processes, services, and data. Consequently, many reference models have been developed in the field of SC processes to support the requirements for the related modeling, as well as to apply the development and implementation of supply chain information systems. The aim of this paper is to compare six main supply chain reference models regarding SOA and its underlying concepts and to identify which reference model can support different stages of information system development. The results show that no supply chain reference model can support both the coordination and interaction of process models in more detail and with a service-oriented approach in supply chain process modeling. Moreover, there is a need for a plausible methodology for business process modeling based on the service-oriented approach in the domain of supply chain management (SCM). In today’s business environment, uncertainties in supply chain management (SCM) increase business requirement changes, which result in the further complexity of the supply chain (SC) process. Recent investigations on SC integration have focused on information integration, application integration, and business process integration (Trkman et al., 2007; Mohammadi & Mukhtar, 2017). Accordingly, companies have commenced implementing integrated information systems (ISs) for supporting their business process (Mili et al., 2010). Whenever integration is a matter of concern, it is crucial to share information throughout the SC, and this requires coordinating the flow of information and linking business processes by connecting the ISs to the different participants in the SC (de la Fuente et al., 2010). In this regard, service-oriented architecture (SOA), as a fast-growing paradigm in information technology IT, has been widely applied in SCM and enterprise information systems that use Web service technologies and provide new pattern integration and interoperability in processes, services, and data in order to increase flexibility and agility in the inter-organization network. SOA is an IT architecture model that many organizations utilize to transform current silo architectures into more loosely coupled ones in support of flexible IT services (Demirkan et al., 2008). In addition, SOA is an optimized form of technology architecture, which provides support for services, service compositions, and service inventories (Rosen et al., 2008). In the service-oriented approach, the activities of SC process models can be supported by web services in such a way that a new business process is altered without the need to change any applications. In addition, a company’s ISs can establish new interconnections (Verdouw, 2010). Improving SC performance requires the integration of both the business process and information sharing (Scholl et al., 2012), as well as coordinating activities related to the three main flows; i.e., information flow, material flow, and financial flow (Stadtler & Kilger, 2008; McCormack & Johnson, 2016; Mohammadi & Mukhtar, 2017). As a consequence of the complicated interactions within the SC, which involves multiple enterprises and relevant resources, the operations of the SC participants should be effectively aligned to reduce the total expense and enhance the level of customer service (Bae & Seo, 2007). The coordination of operations in SCM is the major purpose of SCM, which necessitates modeling and integrating processes. The number of decisions that are to be executed and the data load that is to be processed or exchanged entails the construction of an accelerated IS that can support the flexibility of handling unexpected changes and events in the SC process (Verdouw & Wolfert, 2010). Hence, the business process should be structured in a flexible manner to allow full use of SC information (Trkman et al., 2007) and to organize the activities among SC participants (Lambert, 2008). 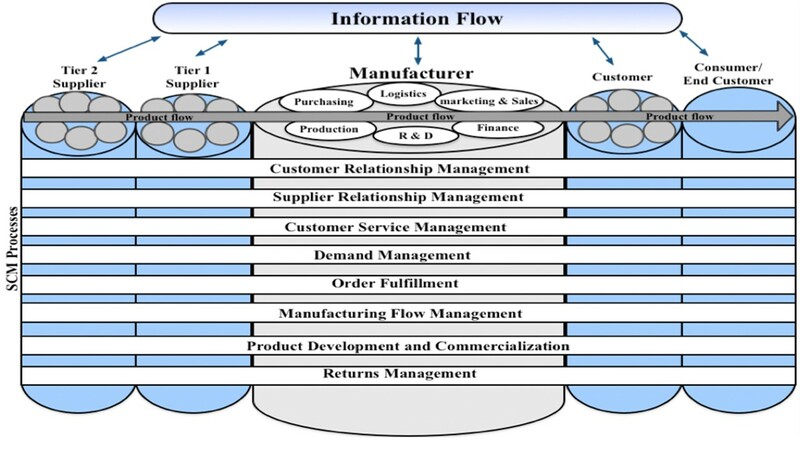 To effectively consider the business process entails placing emphasis on process models as the core object for the attainment of the necessary agility and interoperability of information systems (Verdouw & Wolfert 2010). For this purpose, one can implement SOA as a fast-growing paradigm in IT, widely applied in SCM and enterprise ISs (Komoda, 2006). SOA makes possible the dynamic reconfiguration of SCs, enabling them to readily adapt themselves to the changes within business models and to expanding globalization and the increasing need for coordination. The adoption of the SOA paradigm is facilitated by the conversion of ISs and data sources into modular service components, which can be designated, pinpointed, and invoked by other applications by means of a standard protocol. Moreover, multiple applications in SCM reuse the full range of these service components (Cheng et al., 2010; Mohammadi & Mukhtar, 2017). The aim of this paper is to compare six main SC reference models regarding SOA and its underlying concepts and to identify which reference model can support different stages of IS development. Section 2 presents the research method and describes evaluation methods. Section 3 discusses the existing SC frameworks and reference models including SCOR, GSCF, VRM, CPFR, ISA95, and SAP. This review identifies the limitation of current SC reference models and pinpoints what is needed to support an IT-based SC process. Section 4 discusses the underlying concepts of SOA in terms of the enterprise business process. Section 5 compares and discusses the most important SC process reference models. Finally, the last section summarizes the paper and provides guidelines and recommendations for further research work. This section concentrates on consolidating the existing supply chain reference models by utilizing the most common evaluation method, namely, the feature comparison method. Previous comparative researches have sometimes provided a crystal clear evaluation methodology; for example, Siau and Rossi (2011) conducted a survey on method evaluation. They presented a holistic comparison on evaluation methods and classified them in three categories: the feature comparison, the theoretical and conceptual investigation, and the empirical evaluation method. In the evaluation method category, the empirical evaluations have some disadvantages; for example, they decrease the level of efficiency. Further, the survey method and the verbal protocol method need to access human subjects, and the model created in laboratory experiments may not be suitable in the real word (Siau & Rossi, 2011). Also, the field experiment method is difficult to apply in an IS context (Moody, 2005). The feature comparison technique is used by developing a checklist of ideal method features with which methods or modeling techniques are evaluated. A clear understanding of the ordinary methods indicates that the theoretical and conceptual investigation methods are less subjective and do not require empirical data (Siau & Rossi, 2011). Thus, in light of the above, with the feature comparison method, it is relatively easy to evaluate SC reference models provided that the criteria are well-defined in the checklist (Siau & Rossi, 2011). With regard to the evaluation of SC reference models, the most important features are identified. This section provides an overview of the existing SC reference models and frameworks, which have been broadly applied in the past years in the domain of SCM. According to Lambert and Cooper (2000), the SC is not a chain of Business to Business (B2B) relationships, but a network of several businesses. The management of the relationship in this network is referred to as SCM. In the concept of SCM, a SC is defined as a chain within an organization which involves a linked set of diverse upstream and downstream activities and processes that produce value in the form of services and products for the end customers (Figure 1) (Christopher, 2005; Roh et al., 2017). The SC reference models are used for the design and development of software components; they also support different stages in the development of ISs, including requirement engineering, design, and implementation (Verdouw et al., 2010). In the development of ISs, process models are the first and essential artifacts that are concerned with requirement documentation and communication to stakeholders (Dumas et al., 2013). In the first stage, requirements should be defined via modeling a business process (Wolfert et al., 2010). In the SC domain, the reference models and frameworks which support different stages of IS development consist of the Supply Chain Operation Reference (SCOR) (Council, 2010), Global Supply Chain Forum (GSCF) (Lambert et al., 2005), Value Reference Model (VRM) (Value Chain Group, 2007), Collaborative Planning and Forecasting & Replenishment (CPFR) International Society of Automation (ISA)-95 standard (ISA, 2005), and System and Application Products (SAP) reference model (Curran, 1999; Kurbel, 2014). The SCOR model was developed by the Council of Supply Chain Management in 2005 as a cross-industry model to represent business activities and processes of the SC that can be used in the requirement stage of IS development (Verdouw et al., 2010). SCOR includes five business processes: plan, source, make, deliver, and return. However, SCOR does not provide a mechanism for process specification levels in detail (Chandra, 2008). As a result, SCOR does not have the potential to specify process services in SOA. Moreover, SCOR focuses on production strategy rather than on SCM strategy (Stavrulaki & Davis, 2010). The GSCF is a SC framework founded upon eight key business processes in which each business process is managed by a cross-functional team, including representatives from logistics, production, purchasing, finance, marketing, and reseach and development (R&D) (Lambert et al., 2005). The GSCF framework is cross-firm and cross-functional and deals with production, R&D, logistics, marketing, purchasing, and finance (Lambert et al., 2005; Verdouw et al., 2010). It defines the corporate strategy in SCM, links the strategy to the business processes (Lambert et al., 2005), and supports the requirement stage of IS development (Verdouw, 2010). The Value Chain Group developed the VRM, which is similar to the SCOR and is used to specify SC processes on strategic, tactical, and operational levels (Verdouw et al., 2011). It contains process models and metrics, focusing on the planning, governing, and execution of activities for logistics, product development, and commercial processes (Value Chain Group, 2007; Verdouw, 2010). Further, the VRM supports the requirement stage in IS development, and it is integrated with SOA based on Federated Enterprise Reference Architecture (FERA) (Verdouw et al., 2010). However, VRM is limited to information flow and the value of the information (Heinzel, 2005). Moreover, it does not support key SC processes and activities; for instance, it does not include the return management process (Kirikova, 2012). CPFR provides a general framework, focusing on demand and supply management, strategy and planning, and execution and analysis. The framework contains process and data models that can support the design stage of IS development (Verdouw, 2010). Nevertheless, the framework does not identify major business processes in SCM; it addresses, in fact, four SC processes which include supplier-managed inventory, conventional order management, co-managed inventory, and retail vendor managed inventory (VMI) (Verdouw, 2010). Further, the primary focus of CPFR is the relationship between buyer and supplier (Trienekens et al., 2008). The ISA-95 standard addresses the exchange of data within enterprise systems (planning and production management systems) (Hvolby & Trienekens, 2010), including a number of components, such as manufacturing operations and control and business planning and logistics (Verdouw et al., 2010). It can be used in the design stage of IS development (Verdouw, 2010), but the scope of the ISA-95 standard is limited to describing the function, domain, and control of an enterprise (Hvolby & Trienekens, 2010). The SAP Production Solution Center developed SAP-ERP to support the process and application of SCM (Heidasch, 2007) that could, in turn, support the implementation stage of IS development. SAP/R3 cannot address every aspect in regard to supporting entire SC processes, such as the relationship between suppliers (SRM) (Heidasch, 2007). Moreover, SAP is primarily focused on implementation of ERP and consolidates very detailed system models in which the models are focused on one single enterprise (Verdouw, 2010). An overview of the aforementioned reference models is summarized in Table 1. This table shows the extent to which these reference models meet the IS development and scope of SCM. From the viewpoint of IS development, there are only three reference models, namely SCOR, GSCF, and VRM, which support the requirement stage by prescribing the decomposition level of SC processes. Table 1 describes how the SAP and ISA-95 support the implementation stage of IS development and how CPFR supports IS development in the design stage. Since business process modeling belongs to the requirement stage, none of the reference models supports both the coordination and interaction of process models on the lower level (Lambert et al., 2005; Verdouw et al., 2011) nor the service-oriented approach in SC process modeling. Of the two reference models SCOR and the GSCF, which have been widely used in production and SCM, SCOR meets the operation strategy, while the GSCF meets the SCM strategy. SCOR focuses on specific activities in SCM, and the GSCF focuses on the relationship between suppliers and customers; however, neither of them can describe SC processes from different viewpoints nor address the inter- and intra-organization processes in detail (Grubic et al., 2011). in the production of new applications which do not yield easily to further modifications (Carey, 2008b), particularly in SCM. There are numerous tiers within a modern SC, ranging from suppliers to manufacturers, distributors, retailers, and customers. A well-defined architectural style is required for building a web-based IS for SCM. However, the existing architectural styles, such as enterprise application integration (EAI) approaches and object-oriented architecture, do not have adequate capability to produce a flexible IT architecture which is able to adapt itself to the ever increasing pace of business needs (Rosen et al., 2008). This problem can be addressed by SOA, as it is a fast-growing paradigm for designing a flexible enterprise IS to enhance agility (Komoda, 2006; Bieberstein et al., 2008; Franco et al., 2009). The service provider, service consumer, and service broker are three primary elements in SOA. The service provider publishes a service description and provides the implementation of the service. A service consumer or requester finds a service description in the service registry and then binds and invokes the service. The service broker provides the service registry. However, the service broker is optional, and the service consumer can obtain the service distribution directly from service provider (Carey, 2008). Figure 2 shows the conceptual model of the SOA style. SOA, in comparison with the existing architectures and approaches, initially permits business partners to share their internal information by incorporating the acquired data into individual service units, which are available across the network. SOA-based systems perform two tasks: (1) they allow the transference of information along the enterprise boundaries; (2) they make possible the implementation of various applications through those service components that increase the ease of, and flexibility for, SC reconfiguration (Cheng et al., 2010). SOA makes possible the reuse of services within an organization, aimed to support diverse business applications. Service infrastructures, methods, and instruments are to be defined in SOA in order to incorporate services into broader business processes (Rosen et al., 2008). To this end, business architecture must be able to provide an inclusive definition for the entire scope of the service landscape. Business architectures define service groups to support business processes and have effects on business strategies and goals (Rosen et al., 2008). The ability to create meaningful services and to define the specific features of a business process in a service-oriented paradigm requires the consideration of a method which has a higher potential for business alignment. Such a method is required to deal with the analysis and design of services, as well as with the techniques and methodologies (Papazoglou et al., 2007; Mohammadi & Mukhtar, 2013). Therefore, in the representation of the SC processes in a service-oriented approach, the modeling relationship between the processes and services must be clear. In regard to all the factors thus far discussed, during the creation of an IT-based business process for SCM, it is essential to initially analyze the business domains and process areas of the given enterprise. Next, it is necessary to model the business processes which are to be supported by the SOA. Eventually, the process models have to be converted into service orchestration descriptions. Hence, in this approach, business process modeling plays an important role, which is also an essential step in developing an IS for SCM (Verdouw et al., 2011). Therefore, the next section discusses the interplay between business process management and business process modeling, emphasizing the specific techniques for SC process modeling. Modeling the SC process in a service-oriented approach requires both service specification and business process configuration as a sequence of services (Papazoglou et al., 2007; Verdouw et al., 2011). To do so, it is necessary to depict the internal activities of an organization and the interaction between business partners, which are known as process choreography and service orchestration, respectively (Albani & Dietz, 2009). Regarding the ability to meet the requirement of modeling the SC process, the aforementioned reference models are compared with each other and summarized in Table 2. Regarding the comparisons detailed Table 2, it should be noted that, although SCOR is widely accepted in industry, it only focuses on specific activities in SCM and has its limitations for the description of SC processes from different viewpoints (Lambert et al., 2005). In the scope of SOA, SCOR and SAP, only content of business logic is supported. Also, only these reference models among others only support the detailed model of the SC process. No reference model in Table 2 supports service identification in Service-oriented modeling approach. Overall, no SC reference model can support both the coordination and interaction of process models in more detail, that is, neither the representation of detailed process models (Lambert et al., 2005; Verdouw et al., 2011) nor the service-oriented approach in SC process modeling. Hence, specific tools and methodologies are required to procure an interpretable, methodic, and comprehensive explanation for the information about the processes (Kalpic & Bernus, 2002). Thus, not only is there a need for a plausible methodology for business process modeling based on a service-oriented approach, which represents the necessary details of the SC process, but the methodology must also be applicable for IT experts, process analysts, and business managers. However, thus far, a modeling methodology for SCM that provides the details of the process model has not been proposed. The 21st century business environment has to face the challenge of ever increasing uncertainties in SCM. These uncertainties have forced enterprises to utilize e-supply chains. In this challenging context, business administrators prioritize more novel business processes and IT requirements, which, in turn, lead to more complicated SC processes. SC processes have, throughout time, shifted toward IT-based business processes in respect to the SOA to augment the agility, integration, and flexibility of IT-based applications in enterprise networks. Thus, enterprises have embarked on the implementation of integrated ISs to support their business processes. Accordingly, SOA, as a highly capable paradigm in IT, has been increasingly used in SCM and enterprise ISs. In this regard, using Web service technologies leads to the creation of innovative patterns for the interpretability and integration of the processes and services. To address the problems involved in modeling the SC process, several reference models have been proposed and designed in the domain of SCM. These reference models support different stages of information system development. Some of the reference models, which have been highly acknowledged in industry and business, are the MIT Process Handbook, SCOR, GSCF, VRM, CPFR, ISA-95, and SAP. However, the aforementioned reference models do not support the coordination and interaction of process models in detail. Nor do they support a service-oriented approach in SC process modeling. Overall, an appropriate methodology is needed for business process modeling, specifically in respect to the SOA approach. Moreover, the methodology must possess applicability for a variety of users, such as business managers, process analysts, and IT specialists. The survey of previous research on modeling methodology for SCM revealed that there is a need to focus more attention on the details of a process model which has to support the service-oriented view. Appropriate tools, proper methodologies, and formal modeling languages are the basic requirements for handling the problems of process modeling in order to procure a comprehensive and transparent SC process model. It has to be noted that no modeling construct can thoroughly cover different aspects of a process model. Hence, to represent a process model transparently and accurately, it is essential to use specific worksheets, a proper reference model, and a set of appropriate modeling languages to address IS modeling issues. Moreover, in the field of SC process modeling, future researchers should consider the integration of business logic with business rules as well as performance metrics, which would improve the performance of the SC process. Albani, A. and Dietz, J.L., 2009. Current trends in modeling inter-organizational cooperation. Journal of Enterprise Information Management, Volume 22(3), pp.275–297. Council, S.C., 2010. Supply Chain Operations References Version 10.0. Supply Chain Council. Kalpic, B. and Bernus, P., 2002. Business process modelling in industry—the powerful tool in Enterprise Management. Computers in industry, Volume 47(3), pp.299–318. Rosen, M., Lublinsky, B., Smith, K.T., Balcer, M.J., 2008. Applied SOA: Service-oriented Architecture and Design Strategies. Wiley Publishing, Inc.